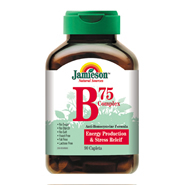 B75 Complex is an anti-homocysteine formula for energy production and stress relief. Each tablet contains: Vitamin B1 75mg, Vitamin B2 75mg, Niacinamide 75mg, Vitamin B6 75mg, Vitamin B12 75mcg, Biotin 75mcg, Pantothenic Acid 75mg, Folic Acid .6mg, Lipotropic Factors: Choline Bitartrate 75mg, Inositol 75mg. Also contains Para-Aminobenzoic Acid.